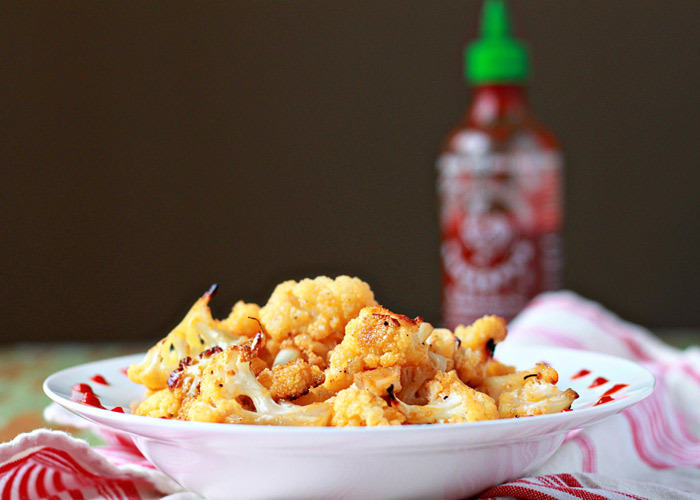 Cauliflower, tossed in maple syrup and spicy Sriracha, gets crispy-edged and caramelized in the oven. This irresistibly sweet/spicy cauliflower is equally perfect for game-day snacking, a dinner side, or just straight-up lunch. I’ve recently started eating less dairy, not because I don’t love most of it (umm, cheese), but because I am learning that dairy just might not agree with my body. Also: I was eating a LOT of it. More than I realized. Stupid food diary exposing the truth about my eating habits (and issues). But if consuming less dairy means I’m eating more simple vegan recipes like this Maple-Sriracha Roasted Cauliflower, well … cheese, don’t let the door hit you on the way out. 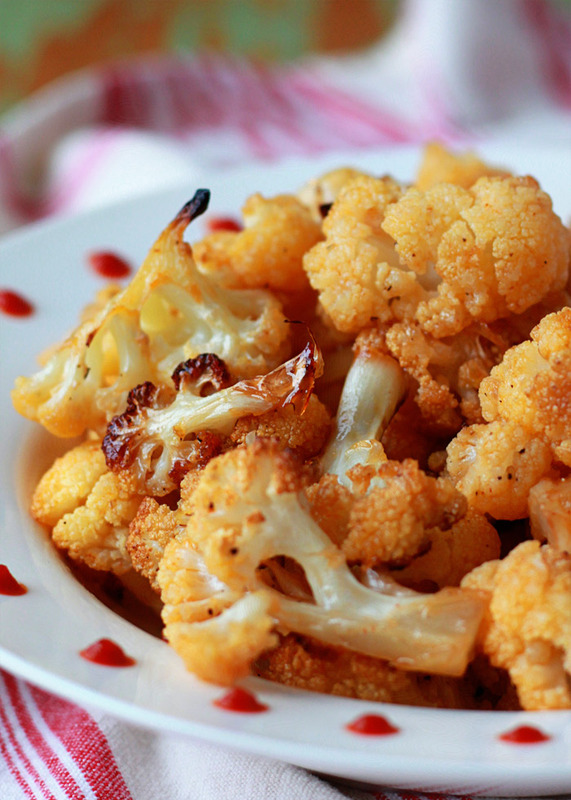 Roasted cauliflower is a seriously addicting snack. Or side. Or main. It gets tender, goldeny-caramelized, and a little crispy edged as it roasts, transforming into something so utterly scrumptious that it’s entirely possible to eat a whole head of cauliflower this way. Not that I, um, know anything about that (see: less-than-stellar eating habits again). But adding pure maple syrup and spicy Sriracha to the mix? Oh. My. Stars. 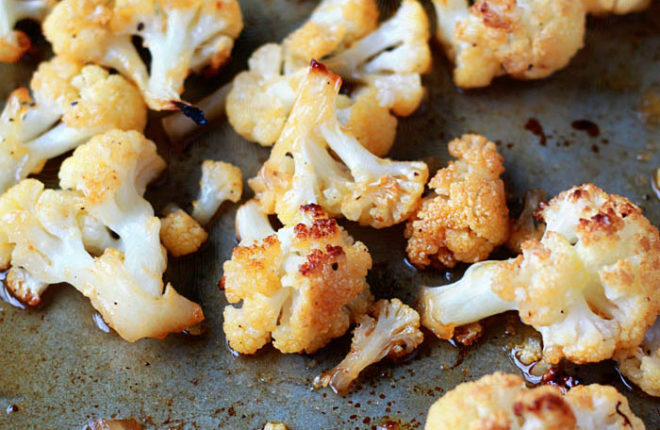 Roasted cauliflower just got a heckuva lot more addicting. Not that I needed for that to happen. It’s super-duper easy to make. 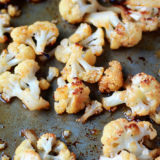 Just toss bite-sized cauli florets in a mix of olive oil, maple syrup, Sriracha, salt, and pepper. Spread on a cookie sheet and bake for about 25 minutes, and sweet/spicy nirvana awaits. I like to serve it up with a few extra dots of Sriracha for a little extra kick. So. Good. You could also present it wing-style with a cooling dip like blue cheese or ranch, and maybe a few celery sticks, even. But I have enough of a problem controlling myself around this stuff just the way it is, straight-up. Ah well, at least it’s cauliflower instead of cheese. Preheat oven to 450 degrees Fahrenheit. In a large bowl, whisk together the olive oil, maple syrup, Sriracha sauce, salt, and black pepper. Add the cauliflower and toss until well-coated. Spread on a large rimmed baking sheet and bake, stirring once, until tender and golden brown, about 25 minutes. Serve with additional Sriracha sauce, if desired. All images and text ©Kare for Kitchen Treaty. 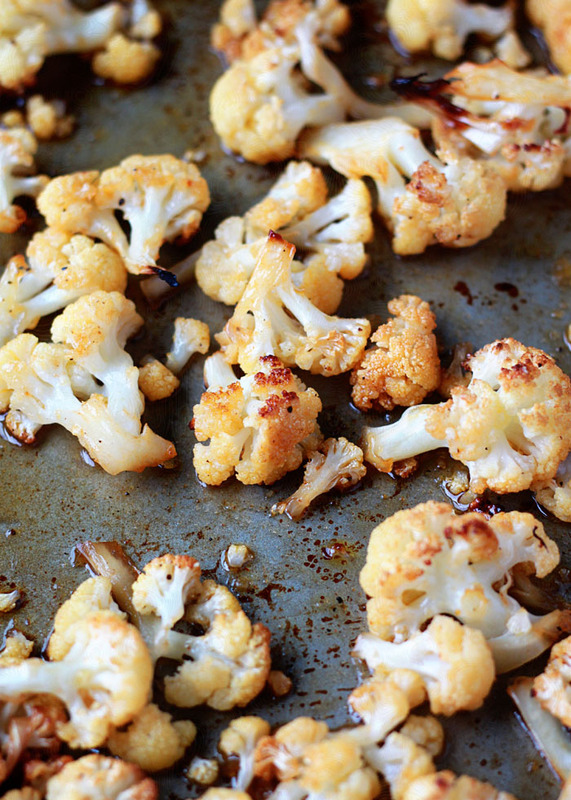 We roast cauliflower all the time (BEST side dish ever!) but I am loving your addition of Sriracha and maple syrup! What a fantastic idea. Yummm! 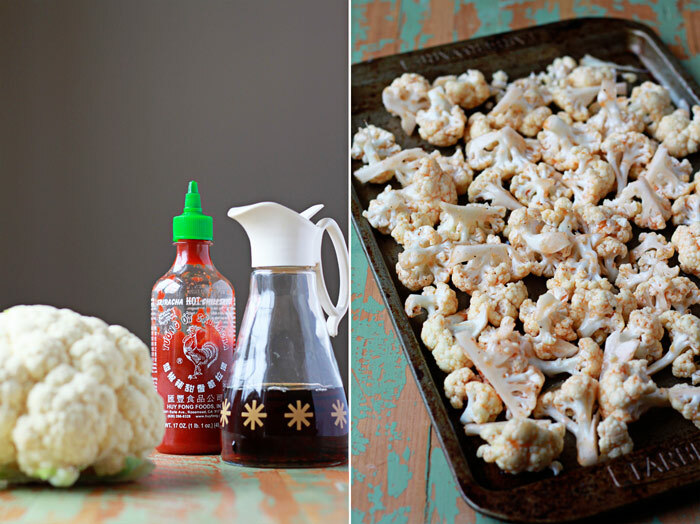 I do a harissa roasted cauliflower that I’m in love with, but maple and Sriracha? Come to momma! I’m weaning off dairy too, but this recipe makes me now want to look back! This sounds amazing. I often use Sriracha sauce but never thought to combine it with maple syrup. Wow! Thanks for the idea. When I did a paleo challenge two Januarys ago I was shocked at how muhc dairy I ate as well. It also made me realize how bloated it made me by the end of any given day. Crazy! Granted, I’ve gone back to my dairy ways b/c I just love it too much but I’d still gladly eat this kickin’ cauliflower too! Ooo – love the combo of the maple syrup & Sriracha – yum!! I love when things have a little kick, so I definitely need to give this a try. I made the recipe last night! So delicious…I ate the entire thing. Do you think that there’s a way to make it with less oil? I’m a Weight Watcher, so I’m trying to get make it for less points value. Thanks! Made this recipe yesterday. I upped the sriracha to a full T as we like things spicy. I had a small cauliflower head so I added a few baby carrots and a handful of small new potatoes cut in half (stuff I had on hand and needed to use). 25 mins was perfect, everything had a nice char. Very flavorful recipe. Thanks for posting. Will the recipe work made with less oil? I haven’t tried it with less oil, but probably 2-3 tablespoons should still be fine. Oh my stars in heaven, that looks good! So happy I found your website- we’re newly vegan and struggle sometimes with missing meat and dairy. This looks like something that would be a fabulous replacement for fatty snacks. I am new to your blog but you drew me in with this recipe. I made it tonight and it was fabulous!! A new favorite. I may have to make it again tomorrow!! I used 1 tablespoon of oil and roasted the vegetables in a well-seasoned pan – it was plenty of oil. I also added broccoli because I had some – that was delicious also. Thank you for sharing! I’m subbing to your blog! Oh, Sriracha might just be your new best friend! 🙂 Great to know it still works well without the oil – thanks! I always try a new vegetable recipe at Thanksgiving. This was the best one yet! So simple, so good! My son, who is not a big vege eater liked them! I’ve made i several times since, it’s now in my side dish rotation! Thank you! I’m so glad you like this one! Your comment reminded me about this recipe, which I myself haven’t had in awhile. I need to change that ASAP! Thanks for the comment/rating! I loved this recipe. I used less oil and less maple syrup and it tasted yummy! So glad you like it! 🙂 It’s a fave here too. Love that sweet/hot/salty situation.